Apple continues to express interest in developing affordable technologies that could in the near future deliver an easy-to-use augmented reality platform to its iOS devices like the iPad through the use of split-screen software techniques or transparent display screens, company filings reveal. Augmented reality (AR) is a term used to describe a live direct or an indirect view of a physical, real-world environment whose elements are augmented by computer-generated sensory input, such as annotations, sound or graphics presented through an information layer. In one filing published for the first time Thursday by the United States Patent and Trademark Office and discovered by AppleInsider, Apple notes that despite strong academic and commercial interest in (AR) systems, many existing implementations are complex and expensive, making them unsuitable for general use by the average consumer. 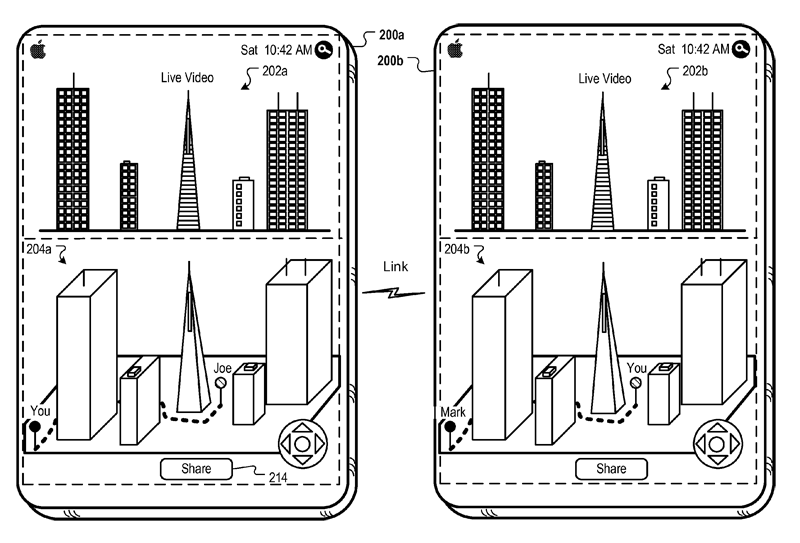 As part of its filing, Apple proposes that iPads could feature a split screen display that can be used to display an object or subject matter such as a live video feed from the tablet's camera on one side of the split, and computer-generated imagery identifying elements in that video feed on the second side of the split. In one example shown, a user is viewing a live video of the skyline of downtown San Francisco in first display area, while object recognition is performed in real-time on a captured frame of the video to present information on the second display area, such as balloon call outs identifying the buildings or structures in the live video. Software running on the iPad could utilize onboard positioning system such as GPS, WiFi, and Cell ID ,along with motion sensors to transmit information about the live feed to a network service, which could then spit back 3D models of recognized objects in the live feed that the user could navigate in real-time. "For example, gyroscopes, magnetometers and other motion sensors can provide angular displacements, angular rates and magnetic readings with respect to a reference coordinate frame, and that data can be used by a real-time onboard rendering engine to generate 3D imagery of downtown San Francisco," Apple said. "If the user physically moves device, resulting in a change of the video camera view, the information layer and computer-generated imagery can be updated accordingly using the sensor data." 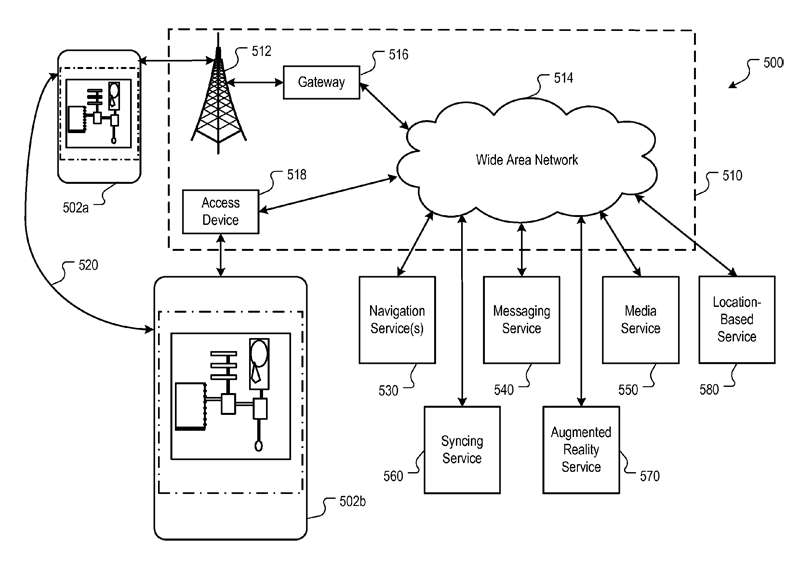 More specifically, the company provided an example where the user sets a marker via a pushpin on a building seen in the distance so that a driving or walking route can be computed in real-time and overlaid on the 3D computer-generated imagery to provide directions to that building from the user's current location. Optionally, Apple added that the annotated live video, computer-generated imagery and resulting information layer can be shared via a Share Button with one or more other devices, and the AR displays of the devices can be synchronized to account for changes in video views. While the filing proposes an AR implementation utilizing existing technologies found on the iPad (and iPhone), a second filing from the company relating to the same subject matter is slightly more ambitious in that it proposes iPads with a display screen having a viewing area with a transparent portion that enables a user to view objects behind the electronic device by looking through the display screen. 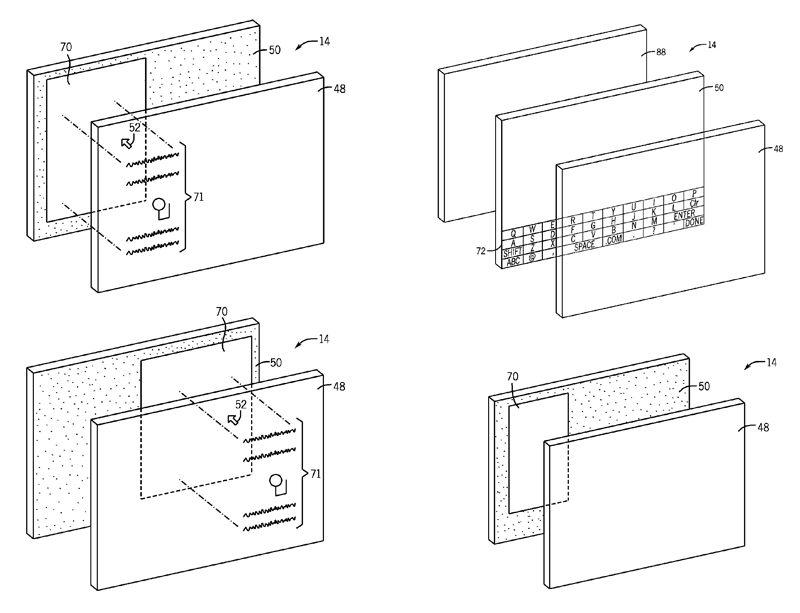 The "transparent portion may encompass the entire viewing area, or only a portion of the viewing area of the display," wrote Apple engineer Aleksandar Pance, who is the sole inventor credited to the patent application titled "Transparent Electronic Device." He added that additional implementations could call for an iPad with two or more display screens (each having respective viewing areas with transparent portions) arranged in an overlaid or back-to-back manner, or two display screens whereby one display screen is partially opaque but displays a transparent window that's movable via multitouch input from the user.
] For example, a tour bus may include one or more displays as windows for users. These displays may present overlays that impart information about locations viewable from the bus. The same filing also details a viewing routine that would allow a user to view both images and real world events simultaneously via a single display screen. For example, the viewing routine may allow for a portion of the display to be selectively transparent while the remainder of the area of the display screen is opaque. "For example, display screen may include an in-plane switching LCD screen in which pixels of the screen default to an 'off' state that inhibits light transmission through the screen," Pance explained. "This may be accomplished by driving a voltage to zero to the pixels in an 'off' state (i.e., the pixels in an opaque region)" while "voltage could then be applied to pixels of the display screen to enable light transmission through such pixels (when desired), allowing a user to view real-world objects through the activated pixels of display screen, thus generating a window in the opaque region."